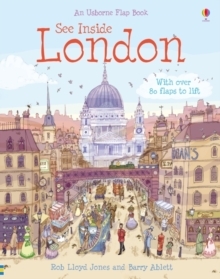 Delve deep under London’s streets from the days when the Romans ruled through to the hustle and bustle of the modern-day capital in this brand new title in the “See Inside” series. This title includes double page spreads on medieval times, the Tudor period, the Plague, the Great Fire of London, the restoration, Victorian London and the Blitz, each containing absorbing and fascinating historical detail. It contains over fifty sturdy flaps.